Windows 10 PC build 14960 and Mobile build 10.0.14960 are under testing. Windows insider team is testing Windows 10 Redstone 2 PC build 14960 and mobile build 10.0.14960.1000. 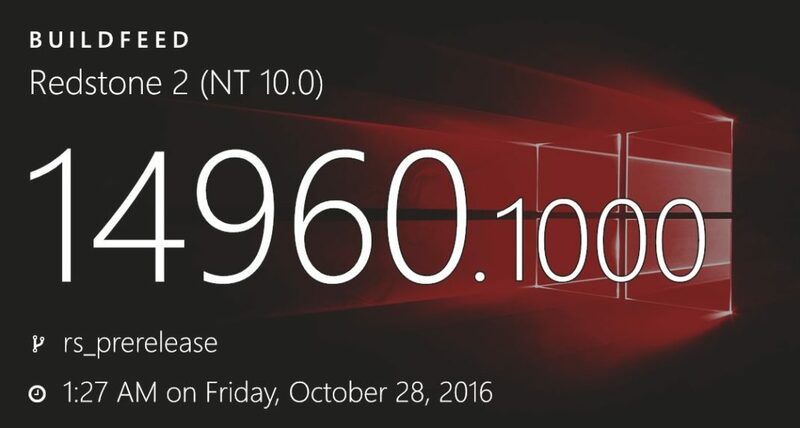 The internal build 14960.1000 was compiled on October 28, 2016. The cumulative update build 14393.444 (Redstone), build 10586.639(Threshold 2) and build 10240.17157 (Threshold) are also under testing. Microsoft officially announced that next Redstone 2 update will be called ‘Creators Update’. The Creators Update will be available in March-April 2017. Check out what’s new features are coming with the Windows 10 Creators Update here. Windows 10 1607 cumulative update kb3197954 build 14393.351 is available for everyone. If you are facing a problem with the update, check out here for fixes. Recently, Microsoft also rolled out build 14955 to fast ring insider members.